For the next month at American Quilting we will be holding a Charity Fundraiser for the Paul Peterson Cancer Fund. Each Monday November 5th - December 30th we will have 8 quilts up for silent auction. Bids will start at 10:00 am Monday morning and end Saturday night at 6:00. 100% of the proceeds will go to the Paul Peterson Cancer Fund. Donations will also be accepted at American Quilting or at Mountain American Credit Union. 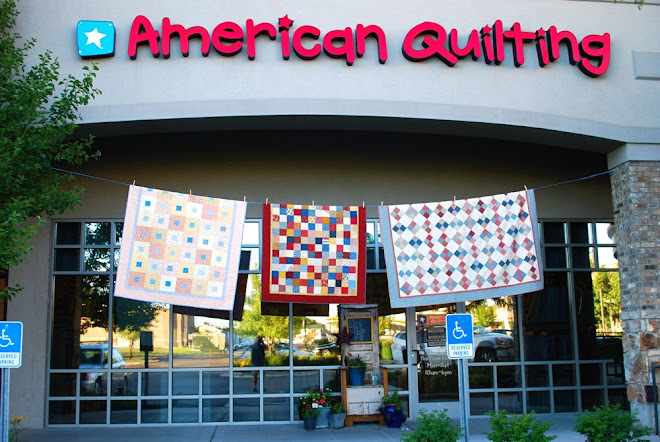 The quilts will be hanging at American Quilting 426 W. 800 N. Orem, UT. We will also post them each week on this blog. To bid on quilts please call the store at 801-802-7841. #1 a winter throw quilt measuring 60" x 70" Made entirely of minkie (incredibly soft) fabrics. #6 Hand appliqued baby quilt. Measures 42" x 42"
This is a perfect opportunity to get a beautiful, high-quality quilt in exchange for helping with a special cause. I got confused on what was up for bid this week! I went in today to bid on #5 Throw size (about 60" x 80") quilt made from Moda's Simple Abundance collection (the one with off-set tiny red squares in each colorful block). I found out from Karen that it was from LAST weeks auction. If it didn't sell, may I bid on it? Moonlight Madness 2010 - this Friday!